Good: Getting that stuff in the picture for Valentine’s Day. I think this means that Dale finally “gets it” about the knitting. 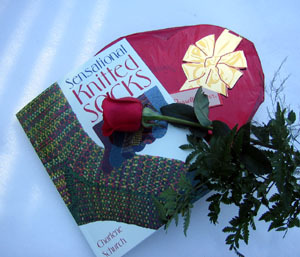 Bad: Getting a new sock book while in the middle of the Knitting Olympics. Good: Receiving my 2000th comment on the blog! Bad: Having the 2000th commenter be Dale. I can’t exactly send him yarn for a prize now, can I? Good: Singing at the top of my lungs while Sirius radio plays in the Jeep. Bad: Sirius Radio cutting out. Ugly: Hearing my singing voice minus the radio. Yuck! Good: Finding out that Hannah doesn’t need a root canal! Bad: Calculating that the rest of the dental work she needs will still cost around $1000. Good: Getting a new refrigerator with all kinds of fancy stuff. Ugly: Customer service from Sears. I won’t bore you with this whole story but it’s been a disaster. My advice? Don’t buy anything from Sears unless you can carry it out yourself. Good: Heading to SPA this weekend with Blogless Sharon. I’ll be meeting up with old friends and making new ones, too. It doesn’t get any “gooder” than this and that’s a good way to end this post! Good: Having a heartfelt discussion with my quilting friends about my lack of interest in quilting these days. 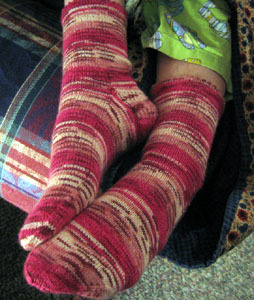 I love my friends and want to see them but really want to knit and not quilt. We all agreed that what matters is getting together, not whether someone is quilting or knitting or just sitting around doing nothing. We even decided to change our name from the “Hungry Quilters” to the “Hungry Friends”! Now that’s friendship, kids! 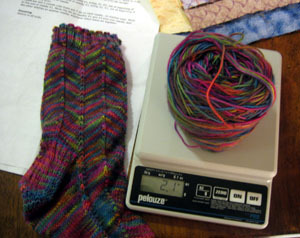 Good: Finishing sock #1 for the Bloomin’ Feet swap. 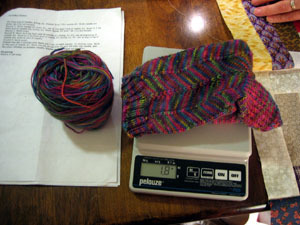 Good: Weighing the remaining yarn and finding out there’s enough for sock #2. Yippee! Bad: Not having finished a book in ages! I’ve tried and tried but it seems like no matter what I pick up, nothing holds my interest. I’m a librarian and this is bad. I’m open for suggestions, though. If you have any ideas to get me out of my reading slump, I’d love to hear them! Ugly: Learning about RFID technology and consumer privacy. I attended an eye-opening workshop on this subject last week. Let’s just say I won’t be recommending this for my library anytime soon. Good: Having 32 people sign up for the Buy More Yarn program! I thought I might have 10! 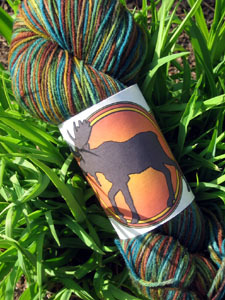 Good: Supporting yarn shops through this endeavor. Bad: Competing against the likes of Risa, Dave and Aunty Nin. Ugly: Writing all that freakin’ html! Good: Receiving a sheep ornament from Margene for hanging on Lucy. Lucy loves jewelry! 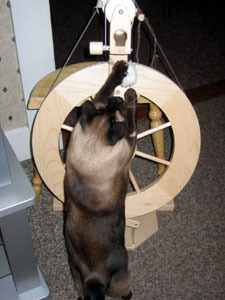 Bad: Having Mason notice the spinning wheel for the first time! 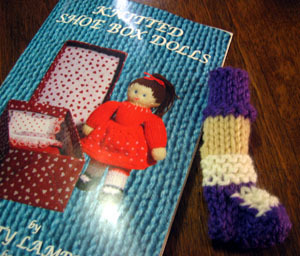 Good: Winning Mim’s mannequin naming contest and having her send me one of her home made books! It’s so pretty. Bad: Forgetting to take a picture of the book so I can show you. 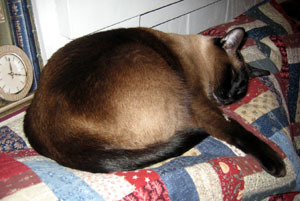 But you can see it here, on Mim’s blog. Good: Stephanie’s Olympic Knitting program. I think almost every blogger in the universe has signed up for this one. Bad: Committing to knitting Lisa Lloyd’s Cable Moss Vest as my Olympic Knitting Project. I read the charts and instructions last night. Yikes. Ugly: I’ll be lucky if I get a tin medal, never mind the gold. Good: Listening to Sirius EZ on the way to work and hearing Barry Manilow, which made me think of Cara and Vicki and Ann. Bad: Hearing Pomp and Circumstance on Sirius Pops. I love the piece but it always makes me cry. Ugly: Remembering just exactly how long it’s been since I marched through a football field to that music. Good: The ladies at Dunkin’ Donuts have my medium black coffee ready for me every morning. Bad: Dropping my medium black coffee in the parking lot at work. Good: Playing Dance Dance Revolution with Hannah, Jessica, Patrick and Dale. Bad: Having to wait my turn. Ugly: Dale’s attempts at playing this game. The man dances to his own drummer, if you know what I mean. Bad: Earning the homemade cookies by recommending her for a new job. Ugly: Eating the cookies for breakfast. Good: Meeting a bunch of new bloggers at Claudia’s last Sunday. Ugly: Keeping up with my bloglines subscriptions now!